I have very little time this week, so let me first answer the question, how is the language coming after 6 months. The language is good I guess but I still can't understand a lot but it's bearable. I wish I had a companion that was more helpful with learning the language, but instead he just gets frustrated and nothing more. It's not for lack of effort either. I study everyday como un hour often more because my companion is always sleeping. I hurt for these problems too. This week I was really trying to be positive and happy but it was just a mask and it kind of caught up with me on Friday morning because we left at like 10:15 and came back at 11:40. I was so down! Iniquity weighs on the soul, let me tell you, even worse because I want to do better. We are supposed to be out at 9:30 and return at 12:30, so yeah that's my life. And even worse, we're having a decent amount of success. It's killing me. I'm not wiping my garments clean of their blood para nada (Jacob 1:19, I think)! Such is life. I believe I got a confirmation from the Lord I'm doing alright given the situation. Well we had a robbery this week, but I'll share the details next week as I just don't have time. However the thing is, I'm incredibly calm and was during the assault tambien. So I view that as I'm doing all I can and the Lord is pleased with that because I was totally fine, very calm considering what happened which is a miracle but we're alright but it's still going to be a long transfer, but such is life, I'm developing a lot of patience. This week was really up and down. Down in the fact that my comp doesn’t really want to work and now I’m with him for 6 more weeks. It looks like the Lord really wants me to learn a lot from this missionary. The up was that we have seen a lot of miracles this week. First, the son of one of the members from his marriage before he joined the church is fantastic, knows a ton, and has an amazing testimony. He was going to get baptized earlier but his mom at the last second wouldn’t give permission. Now however, she’s alright with it, so we’re teaching him. Also the sister of this same member is investigating and has been for a while and she was really down when she found out something about her husband. She was a wreck. We challenged her to read from the LDM or BOM (LDM is the Spanish abbreviation) she said she tried but couldn’t concentrate on what she was reading. We challenged her to open to a random place and read one verse and so we did it there with her and she opened to a verse that was talking about the BOM saying read these words or something like that. After she did it alone that night she opened to Alma 5:62 (I speak by way of command unto you that belong to the church; and unto those who do not belong to the church I speak by way of invitation, saying: Come and be baptized unto repentance, that ye also may be partakers of the fruit of the tree of life.) If that isn’t a miracle I don’t know what is. So yeah the good and the bad of the week thank you for everything! This transfer has been a long one. I don’t know if I’m leaving or if my comp is going to leave or if we’re both going to stay. I just don’t know but Bolivar has been great. My mission in reality is really coming out of its dark ages and a lot of missionaries are lazy when it comes to being obedient and to working. They receive baptisms and they think hay I’m having success so I must be doing it right. They don’t want to be better and they don’t want to improve, they’re content with average. I received a letter from another missionary in the states a couple of weeks ago. In the letter there are some things that were said that are really impressed me. “I want to be a progressing missionary; I don’t want to be dropped. 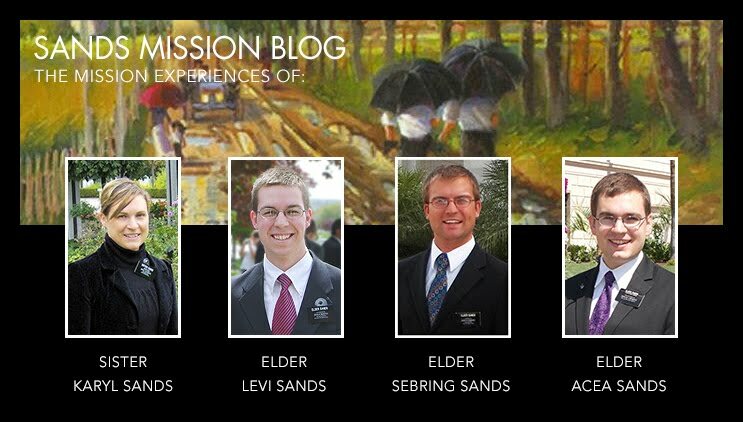 It’s amazing the experience we have on our missions, how much we grow and realize things about ourselves and others. Self-mastery and sacrifice are so important. I choose to follow Jesus Christ and Heavenly Father. I am giving my all to this work.” I love that and I am also choosing to follow our savior and although my companion and others aren’t trying to progress, I’m trying to do my best to give my all to the Lord. He will always repay us with more than we will ever know or be able to give Him in this life. I’m seeing that every day. Obedience, exact obedience, is my goal as it should be for all of us. The Lord will bless us as we follow his will. Thanks everyone for everything and have a great week. Well this week was hard, but I thought of an analogy I really like. I was a swimmer as you all know and the hardest part for me was always starting, because the water is always cold. It's this way because at a certain temperature it is perfect for swimming laps, But when you're not swimming and just sitting around it's too cold. It's kind of like that in the mission. The only way you're going to be happy, content or warm is if you are swimming or as in the mission, working. The manager or Christ has prepared the water for the work or for swimming. We just have to take a deep breath and dive in. I would always swim the butterfly first (it's the stroke that takes the most energy and the hardest) to warm up and I would swim like mad the first few laps to warm up to get used to the water then after I would worry a lot more about technique because I was more comfortable. Work especially in the mission is like that, we dive in trust in the Lord that the pool is the perfect temperature for the work. At first it will be a shock and difficult but as we work we'll get used to it, we'll be warm and comfortable. I could say more about this analogy but I don't have any more time today. Thanks again for all of your love and support, thanks so much!